Summary: Quality tools make the time spent in the home greenhouse much more enjoyable and easier to get work done… so you can enjoy your labor. Because of moisture the greenhouse always consider selecting quality tools. Choose those made of stainless steel or even some of the new recycled products. A good assortment of tools arranged for convenient use is recommended to every home greenhouse gardener. Those tools actually needed are inexpensive and many of the most useful are homemade. The big thing: have them ready for handy use. In a small greenhouse, like mine, without a potting shed, spring clips and hooks can be fastened to a piece of plywood and set below a shelf. Where a large greenhouse is joined to another building, better arrangements on the large area of the back wall are possible. Of course, if you have a work room or potting shed, storage space for tools is no problem. Do not forget to keep your chemicals in a storage cabinet as well. The dampness of the greenhouse must always be considered in selecting tools. Choose those made of stainless or galvanized steel and possibly copper. Plating on tools are as good as nothing when it comes to resisting rust. Aluminum isn’t good either because it disintegrates in contact with soil – especially soil that has been limed. A good sharp stainless steel knife is about the most useful tool in the greenhouse. It is needed for taking cuttings, pruning and many other jobs. Then you need a good pair of shears – I like Felco. Nursery professionals who use them daily will tell you they are best. They are sturdier and better suited for all cutting and pruning jobs than scissors. Plus I also have a pair of safety glasses as well handy. For watering and syringing, you will want a bulb, watering can and hose. It is hard to find a rubber bulb that is large enough. Those 10-ounce models are much too small. I would like to see one made of plastic that holds nearly twice as much. A long-spouted watering can is not necessary unless you have 4 or 5 foot wide plant benches (I prefer using a watering wand). A watering wand is handy, in a large or small greenhouse for watering plants under benches. 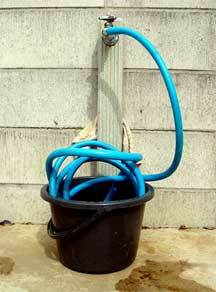 A quality hose (check these garden hose buying tips) is found in almost most greenhouses. Excellent! They are so easy to move about and handle a lot of abuse. Mine reaches any part of the greenhouse. A lever hand control for turning water on and off instantly and a watering wand makes it easy to water without wetting the foliage of soft plants. For syringing and watering-seed flats, the nozzle can be replaced with one which makes a very fine mist. Your dibble and potting stick are best made of hardwood such as ash or oak; soil does not stick so readily to dense grained surfaces. An excellent small plastic dibble is now available as well. Those large steel ones with curved handles are all right for outdoors, but not for light work. Most of us do not find much use for a trowel in a greenhouse or under glass, but a three-cornered flat mason’s trowel is very useful for scraping, tamping, leveling and marking off soil. Shop tools such as screw drivers, pliers and hammer come in for almost daily use. A small can of light oil like WD-40 is a must for lubricating motors and ventilating equipment, as well as tools. Rubber gloves should be used when handling poisonous insecticides (try natural organic) or washing pots. But otherwise, most greenhouse gardeners do not like to have their freedom of movement hampered by extra clothing. After all, we can do practically any of the jobs cited above with our God-given hands, the most useful tools of all.